Palazzo pants are one of the most stylish and comfortable pants. They go well with short tops, t-shirts and also with kameez or kurtis. In this post, I am going to share a tutorial on how to cut and stitch a Palazzo pant. Palazzo pants are very easy to stitch when compared to normal salwars. Though they look similar to a pajama pant and parallel pants, they differ slightly with their cuts. Here I am sharing a simple tutorial on how to cut the fabric and then stitching a palazzo pant. Palazzo pants require about 2 and 1/2 metres of cloth for a normal person. For kids, depending on their age, the cloth required for stitching a palazzo pant can be between 1 to 2 metres. Open the cloth and fold in the reverse as shown such that the two selve edges are on top of each other. Then fold again as shown and mark the above measurements on the cloth. Leave 1/2" along the 4 to 3 line and 1" along the 3 to 5 curve as stitching allowance and cut the cloth. 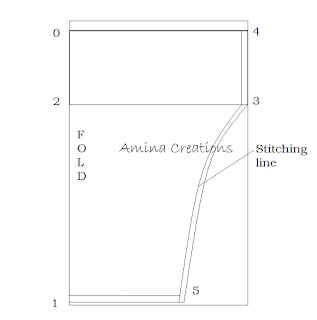 4" is taken extra along the 0 to 1 line, of this 2" is the stitching allowance on top for inserting the elastic and the remaining 2" is for folding and stitching around the ankles. Once the fabric is cut, you will now have two pieces. These have to be stitched together to make a palazzo pant. 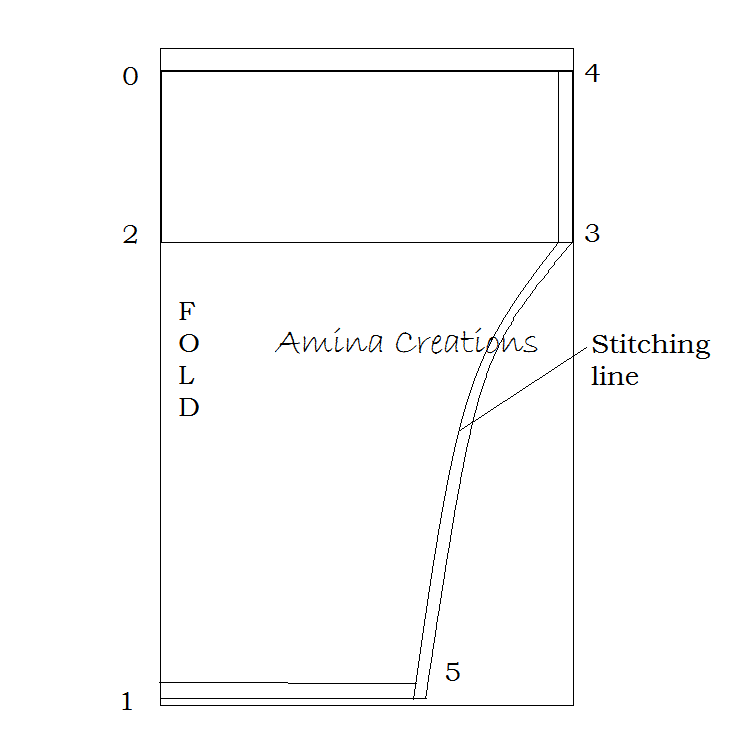 First begin by double folding and stitching the extra cloth(2") along the 1 to 5 line of both the pieces of cloth. Once the ankle part of both the legs have been double folded, stitch along the 5 to 3 curve of both the pieces. You will now have two leg pieces ready. Once done, join the two legs by stitching along the 3 to 4 line. Finally double fold and stitch the extra cloth on the top along the 0 to 4 line to accommodate the elastic. Leave an opening at the centre to insert the elastic. For stitching an elastic, take an elastic of 3/4" or 1" width and length equal to your waist length +2”. Insert it through the opening in the palazzo pant and then stitch the two ends together. Close the opening by stitching on top. Palazzo pant is now ready. They also look good with front opening kameez. And for more dress designing tutorials on frocks, kameez, kurtis and anarkalis, check out the dress designs page and for embroidery designs, check out the embroidery designs page. really you are doing good job , all will benefit.